Maker’s Mark bourbon wins right to dripping wax seal. As it should. 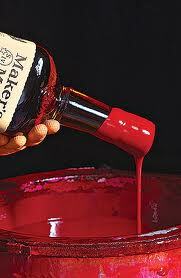 A U.S. appeals court says a liquor bottle with a red dripping wax seal is the symbol of Maker’s Mark bourbon. An opinion released Wednesday by the 6th U.S. Circuit Court of Appeals says only the Kentucky-made bourbon can carry the distinctive bottle topper. The decision comes in an appeal by London-based Diageo North America and Casa Cuervo of Mexico, which used a dripping red wax seal on special bottles of its Reserva tequila. U.S. District Judge John G. Heyburn II in 2010 granted a request by Maker’s Mark for an injunction stopping other liquor companies from using the seal. The Samuels family, which created Maker’s Mark in 1958, trademarked the distinctive seal in 1985. The seal, perfected by Margie Samuels in the family’s deep fryer, doesn’t serve any practical purpose in keeping the bottle closed.